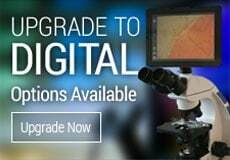 MW1-L2 and MW1-L3 single magnification microscopes include built-in top and bottom lights. 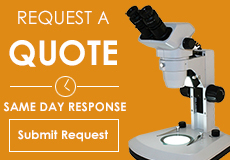 Optional eyepieces may be purchased to achieve different magnifications. Objective Lenses: Available built-in objectives are parfocalled, parcentered, and achromatic and include 2x or 3x. Standard magnification of 20x is ideal for most observations. Eyepieces: Inclues widefield 10x eyepieces. Optional 5x, 15x or 20x eyepieces are available. Each eyepiece has a diopter on left side. Interpupillary adjustment from 50mm to 75mm. Accepts optional 23mm diameter reticle. Total Magnification: Comes standard with either 20x or 30x. Magnification can be changed by ordering additional eyepieces - see magnification chart below. Specimen Stage: Includes frosted glass stage plate and 80mm reversible black/white plastic contrast plate, with locked-on stage clips. Focusing: Rack and pinion focusing with slip clutch and tension adjustment. Viewing head adjustable to accommodate different specimen sizes. Illumination: 12v 10 watt built-in incidental (top) and transmitted (bottom) illumination with base mounted on/off switch. Lights can be used independently of each other. Size & Weight: 10 7/8 " high, 6 lbs. Warranty: 5-Year limited warranty excluding bulbs and fuses. 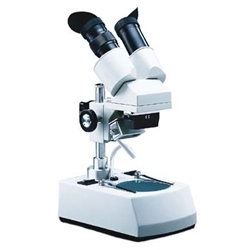 Click here to see ideas of things to view with this microscope.